Monday – Saturday 8:00 a.m. and 4:15 p.m.
For further information, please see attendant at the scale house! (30lbs) minimum charge. All electronic items will be weighed. No limit on how many items are brought in at one time. We will receive electronic items ONLY on Fridays and the first Saturday of the month. DISPOSING of/or RECYCLING OLD PAINT! LATEX PAINT – remove lid and let contents dry out, the dried out material is then safe to be disposed of in the regular trash. OIL-BASED PAINT – remove lid, add clumping style cat litter to absorb and dry up the paint, the dried out material is then safe to be disposed of in the regular trash. Please contact the Franklin County Planning Commission with any additional questions. EARTH 911 – https://search.earth911.com for your use. 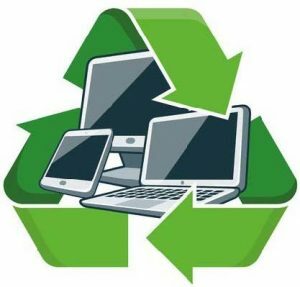 Washington Township, by ordinance, requires residents and businesses located in the Township to recycle. Please also refer to, "Guidelines for Recycling Sheet" at the top of this page. The largest benefit of recycling is the overall reduction of refuse going to the landfills. If everyone recycled, the amount of waste going to our landfills would be drastically reduced, thereby reducing the need for more landfills or landfill expansions. Also, in theory, it would lower our cost because new landfill construction costs would not be passed on to the consumer. The refuse haulers in Franklin County provide recycling as part of their regular service to you. If you have curbside pick-up, you are paying for recycling whether you use it or not. So why not use it? pick-up dates and a list of recyclables that they take, if needed. generate an additional revenue source. container is acceptable for pickup and buy one at any retail outlet. newspaper and cardboard can be recycled at the center at no charge. accepts tires, brush, and appliances for a fee. These items are then recycled. Both facilities are open Monday through Saturday from 8 a.m. to 4:15 p.m.
You do not have to be a township resident to use these facilities. They are available to everyone. Recycling at our facility is free of charge to the general public. The recycling workers at the center would like to request your cooperation with the materials being recy­cled by following these guidelines. Please take the lids off of all plastic bottles, especially soda bottles. Empty cans and bottles of leftover liquids and solids. Syringes/ needles are NOT recyclable, even though they are made of plastic. Bag leaves in plastic bags or place them in the back of a truck as you have done for years and dispose of these leaves free of charge at the Washington Township Transfer Station located at 12721 Buchanan Trail East. The station is open Monday through Saturday 8 am to 4:15 pm. This is still the best and most efficient option if you cannot mow or mulch the leaves back into your lawn. Mulch your leaves on your property using a mulch mower or other equipment. You can then use the mulch in your flowerbeds or garden to improve your soil quality. Ask the neighbor if he/she has a garden and if they would like the leaves for their garden or flowerbeds.